Arthur Constantin Krebs (16 November 1850 in Vesoul, France - 22 March 1935 in Quimperl�, France) was a French officer and pioneer in automotive engineering. Collaborating with Charles Renard, he piloted the first fully controlled free-flight made in the French Army airship La France, which was designed in 1884. The electric-powered flight covered 8 km (5 miles) in 23 minutes. It was the first full round trip flight with a landing on the starting point. On its seven flights the La France dirigible returned five times to its starting point. Krebs shared the 1886 Ponti prize of the French Acad�mie des sciences, with Charles Renard, for their contribution to Aerostation. Krebs inspired Jules Verne, in Vernes novel Robur The Conqueror written in 1886, he tells "the striking experiments of Captain Krebs and Captain Renard". In 1888 Krebs and Gustave Z�d� designed the first modern French submarine, the Gymnote. The submarine was fitted with the first naval periscope and the first naval electric gyrocompass. The latter allowed the Gymnote to force a naval block in 1890. From 1884 to 1897 Arthur Krebs modernized the Ville de Paris fire department; not only its equipment but its organisation as well. His work left a lasting impression in this elite corps up until this very day. In May 1896 Arthur Krebs patented a new automobile, fitted with an electromagnetic gearbox and a layout of the front wheels which re-centred them when the steering wheel was left alone, today this is known as the Castor Angle. Panhard-Levassor company acquired a license to build 500 cars under the name of Clement-Panhard between 1898 and 1902 featuring the latter innovation. 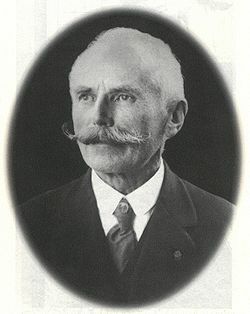 Krebs succeeded Levassor as Panhard-Levassor's General Manager from 1897 to 1916. He transformed the Panhard-Levassor Company to become one of the largest and most profitable automobile manufacturers before World War I. In 1898 Krebs replaced the tiller with an inclined steering wheel for the Panhard car he designed for the Paris-Amsterdam race who run from the 7 to 13 July 1898. Fernand Charron won that race on a four cylinders Panhard & Levassor. At the end of 1898, C S Rolls introduced the first car in Britain fitted with wheel steering as he imported a 6 hp Panhard & Levassor from France. In 1902 Krebs invented the automatic diaphragm carburettor which gave cars continuous power during acceleration by providing a constant air-fuel ratio at all times; this also led to dramatic improvement in fuel economy. In 1906 Krebs traveled to the United States of America to plead in the Selden Case, associated with Henry Ford. Krebs introduced many improvements in car design : the steering wheel (1898), non-reversible steering (1898), engine balance (1898), nickel steel alloys and other special steel alloys (1901), the shock absorber (1906), multi-disc clutch (1907), the electric brake dynamometer for testing high performance engines (1905), the enveloping (globoid) Worm gear differential (1915). Also, Krebs contributed significantly to improve the Systeme Panhard (engine in front, rear wheel drive) which became universally adopted before World War II. In 1909, he became interested in the Knight patent (sleeve valve engine) and was first in France to build that type of engine which Panhard-Levassor would produce during the thirty years leading up to World War II. He made contributions to automotive racing with his powerful cars and motorboats. 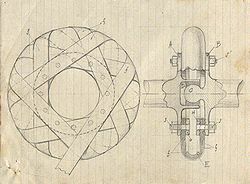 In 1911 Krebs invented the first elastomeric flexible coupling (cf. John Piotrowski). It is known in French as the Flector joint. This device is still widely used today in industry for power transmission as a tyre coupling. The truck was meant for military and civil purposes. Krebs designed it in 1911, jointly with the Chatillon Co, the all-terrain truck named Tracteur Chatillon-Panhard, had four wheel drive and four wheel steering. Many of these trucks were used during World War I as artillery tractors. Krebs also utilized his former military membership to supply the French Army with engines and vehicles including the 1904 Genty Armored car, the 1916 St Chamond tank, the Chatillon-Panhard 4x4 truck, and others. 08/18/1884 - Krebs and Renard : About the "La France" Dirigible. 11/10/1884 - Krebs and Renard : The "La France" Dirigible. 1888 - Krebs : Closed Magnetic Field system of the Telephone. 1888 - Krebs : Electric Engine Trials for a Submarine Boat. 11/24/1902 - Krebs : The Automatic Carburettor. 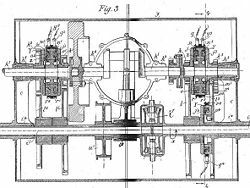 11/13/1905 - Krebs : The Electric Dynamometric Brake. 01/15/1906 - Krebs : The Progressive Shock Absorber. 04/08/1907 - Krebs : The liquid flow measurement apparatus. In 1934, several month before Arthur Krebs's death, the French government awarded him the Badge of Commandeur of the Legion of Honor for his work in Aeronautics and for his contributions to the automotive industry.